Owning a dog is a lot like having a child- exciting in theory, maybe a little scary at first, but always a beautiful adventure that continues on for as long as any love can. Keeping that child healthy and happy? That’s not always an easy feat. Indoor dogs require a certain kind of awareness to ensure they are getting both equal parts affection and wellness care to keep their tails wagging for days to come. Unlike the latest model of smartphone, our pups don’t come with a manual or a user’s guide, but keeping these 12 simple tips in your wheelhouse can help you boost Fido’s livelihood and outlook whenever he needs it most. 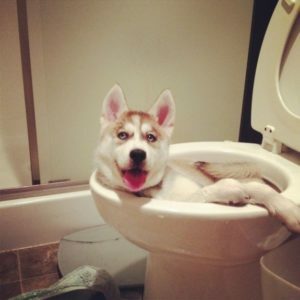 Yes, your dog gets bored too! Spice up the routine by providing toys and changing them out often, open curtains during the day and provide an area where your dog can peek out at the local happenings and use music or TV to lend sound while your away to give him a sense of presence even when no one is around. Structure can be a helpful tool. If your dog learns through consistency that you will leave around a certain time in the morning, say immediately after you let him out everyday, then he has a better chance of relaxing during the quiet time. This decreases his anxiety when you return home and improves his overall mood as you come and go. 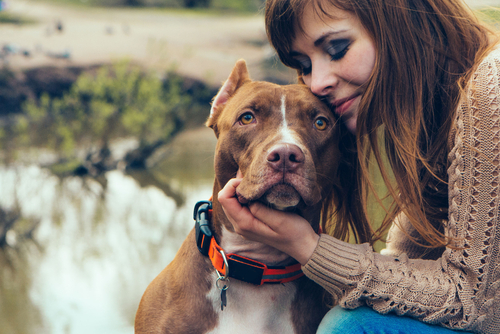 Many factors that will influence your dog’s behavior come from his breed specific needs. 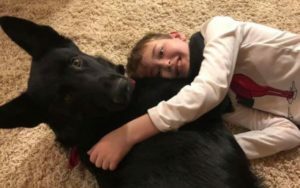 Understanding and knowing the characteristics, weaknesses and strengths of his breed can allow you to maintain his health in a way that is unique to his genes. Setting aside outdoor time is essential. Whether it be for a short walk or a long playdate, exposing your dog to outside senses, new places, people and things can help your dog with sociability and reduce the possibility of aggression. 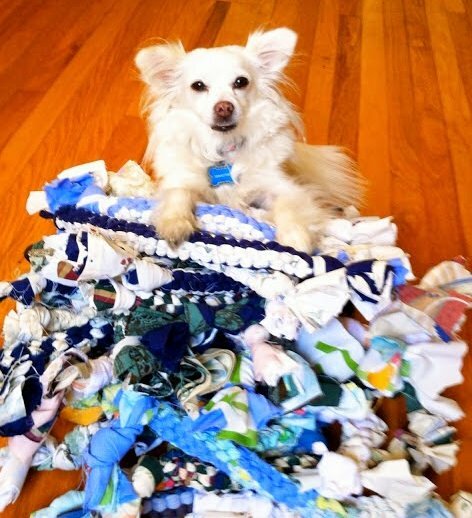 Looking for more great ways to keep your dog busy indoors? Check out these 13 great ideas! Who doesn’t like a nice present? Your pup is bound to get excited over the prospect of a new toy, chew or an offered bone. Treats like these diminish the monotony of his day-to-day. Plus, they can reinforce good behavior and be used as a positive reward at any time. A good Veterinarian should provide you with vaccine scheduling and checkups that shouldn’t be missed because these appointments can aid your dog’s physical and emotional well-being. Although you may think you have the best intentions, seeing your animal everyday can act as a blinder to abnormalities or illness, and a fresh set of eyes can be very beneficial. 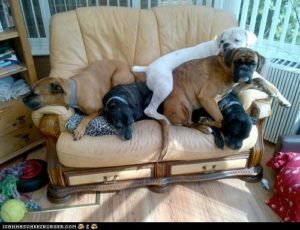 If you’ve got a huge dog, give him a huge space. Take your dog’s size and weight into account when creating an area of his own. 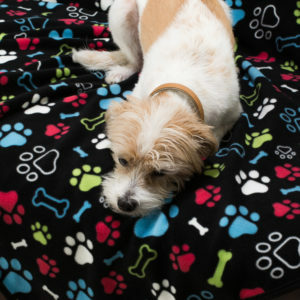 Dressing it with plush blankets, a bed, and even some pillows, can facilitate a comfortable location for your dog to control and feel safe in. Indoor dogs need baths too. Setting standards for your dogs hygiene and the cleanliness of his teeth with proper brushing, coat with necessary grooming, and nails with regular trims can combats future issues that may arise from neglecting them. Not only does food have an effect over mood and health, but it also has the possibility to change over time. Monitoring the amount your dog eats and when, goes hand in hand with the scheduling of his day, and staying on top of what his meals consist of can mean changing his diet to fit his lifestyle, size, and age. Dogs love having a 9 to 5. Employ your dog with a job by teaching him tricks, placing him through training, or allowing him to accompany you in tasks around your home to give him a feeling of purpose that may improve his mood and level out his energy. Dogs can’t talk, but they can tell you many things. Learning his body language while teaching him your’s can have a positive effect on your relationship. Remember to be respectful of his space and be sure to differentiate your que’s for commands and praise to avoid confusion. Time management becomes even more important when you own a dog. Organizing your time to include moments of undivided attention is crucial for his satisfaction. The good news is that this time can be used for all sorts of things- cuddles, playtime, you name it; just give him your all and he will return the favor tenfold. 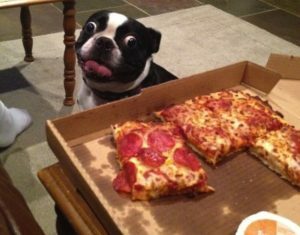 Dogs don’t judge, and it’s one of their best qualities. They offer support through thick and thin, through all of the ups and every single down. So, whether you implement 12 of these tips or just your favorite 2, you’re on the right track towards returning the favor and earning your own title of “Dog’s Best Friend”. The post Stuck Inside? 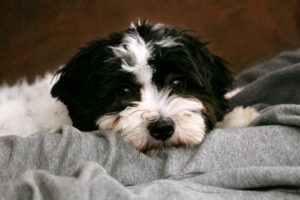 Here Are 12 Tips To A Happier, Healthier Indoor Dog appeared first on iHeartDogs.com.